These set of 16 different crayons (not 8 as shown in picture) washable crayons are made from an exclusive patented formula which allows them to be washed off practically all types of wall surfaces, clothing and upholstery. 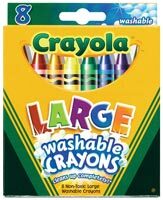 Large crayons, a recommended children's art supplies for ages 3-7 years old, are oversized (4" x 7/16") for easy handling. AP certified non-toxic. A great summer art supply.